From 2021 Elysium Nordic will recover 9,000 tons of carbon black from 30,000 tons of end-of-life tyres, which will result in an annual CO2 reduction of up to 18,000 tons. 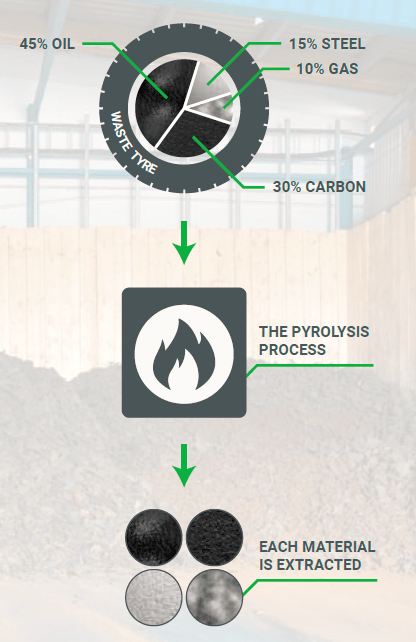 Elysium Nordic uses pyrolysis when re-using the end-of-life tyres. In pyrolysis the tyres are heated up in an oxygen-free environment and degraded to the materials; oil, gas, steel, and carbon black which are subsequently separated from each other. Carbon black accounts for 25 to 30% of the material composition of tyres. To produce one kilo of carbon black, between 1,5 and 2 liters of oil are required. By extracting carbon black from end-of-life tyres, there is no need to extract new oil to make carbon black for new tyres. The gas and parts of the oil will be used to drive Elysium Nordic’s pyrolysis plant, which will make the company self-sufficient in thermal energy. The surplus heat is expected to be discharged into the district heating network. The remaining part of the oil will be sold as bio-fuel, just as the steel and carbon black will be sold for recycling for new tyres. Consequently, there will be no waste product from the plant. In addition to reducing carbon black imports there is a great potential for building new pyrolysis plants in EU. This will create both new business and more jobs, not only contributing to the European economy but also helping European rubber and tyre manufacturers reduce their carbon footprints. When newly produced carbon black is replaced with 9,000 tons of recycled carbon black, the CO2 emissions will be 80% lower which means a reduction of up to 18,000 tons of CO2. The replacement also a reduction in the use of 65.000 barrels of oil per year. Elysium Nordic becomes self-sufficient with thermal energy as e.g. gas and part of the oil from the pyrolysis will drive the plant, which means that there is no waste product. The recovered carbon black is equivalent to the amount that already exists in the end-of-tyres that become pyrolyzed. Therefore, the quality of the recycled material will be comparable to newly produced carbon black. The tyre industry is a relatively conservative industry. Until recently is has been difficult to get the industry to introduce recycled materials despite the obvious opportunities and benefits. Since the pyrolysis plant in Nyborg is the first of its kind, the financing is therefore more complicated than usually. The very strong cash flow expected in Elysium Nordic will eventually be related to the development in oil prices, which is why the cash flow is expected to be associated with some volatility.